I have fit almost exclusively with steel iron shafts for many, many years. When I built EI measuring instruments I checked shaft to shaft consistency in graphite iron shafts. I would not build with what I saw. 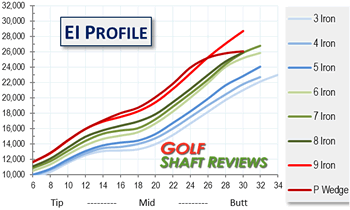 When some premium shafts came to market last year I checked set consistency and saw what I most always see in steel. consistent profiles through out the sets. Furthermore, I saw steel like stiffness and torque in much lower weight shafts. Now that I am at an age where weight matters the stiffness to weight ratio of premium carbon fiber iron shafts got my attention. The Graphite Design Tour AD Iron shafts are not a new product. But my renewed interest in Carbon Fiber iron shafts prompted me to ask for review samples. They came, multiple shafts in 11 different weight / stuffiness models. It took quite some time to measure them. The good news, as you can see in this chart, the profiles inside the sets are consistent. They generally have the same stiffness as steel that is 20 grams heavier. These shafts are worthy of the Graphite Design Tour AD brand. Lets take a close look at the specifications. This entry was posted in 2018 Models, Graphite Design, Graphite Iron Shafts, Russ Ryden - Fit2Score on November 25, 2018 by Russ. The Graphite Design Tour AD VR driver shaft released in late 2018. Like the Tour AD IZ and the Tour AD TP its construction includes TORAYCA T1100G carbon fiber pre-preg with NANOALLOY technology in the tip section. it is quite similar to these two shafts until we get to the tip section. There it is a combination of those two designs. This entry was posted in 2018 Models, Driver Shafts, Graphite Design, Russ Ryden - Fit2Score on November 11, 2018 by Russ. TPT Golf is a division of a Swiss technology and composite firm that developed carbon fiber materials. They have produced America’s Cup yacht sails, lightweight racing car bodies, skis, snowboards, watch bodies, aircraft parts and satellite parts. They offered their prepreg to shaft companies and was told it was too expensive. Their only choice to enter the golf market was to make their own shafts. Their ultra premium shafts quickly appeared in the bags of several marque PGA players. Thin Ply Technology (TPT) shafts have double the layers of material found in typical ultra premium shafts. Prepreg tapes are wrapped on the mandrel on CNC winders. Most other shafts are hand rolled, much like cigars. TPT makes the prepreg ribbon and can orientate the fiber direction in the ribbon. That creates a uniquely new method of creating golf shafts. They can adjust shaft properties in unique ways to adjust shaft performance. I have been to the Swiss R&D site demonstrating the process of EI measurement with my instrument and software. This video was shot on the closing afternoon of the 2018 PGA Merchandise Show. 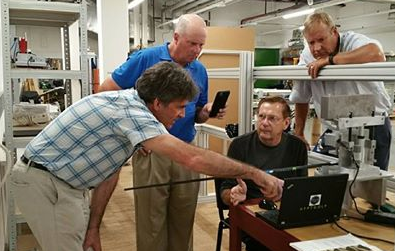 Jeff Meyer, one of the top shaft designers in the business explains some of the TPT technology. Let’s take a look at the Low Kick Point and Mid Kick Point profiles. This entry was posted in 2018 Models, Driver Shafts, Russ Ryden - Fit2Score, TPT Golf on October 16, 2018 by Russ. Now that we have the fifth generation of the Speeder Evolution one wonders if this was a marketing strategy planned at the beginning or that evolved over the years. The fundamental design has not changed,a good thing. Along the way there were subtle tweaks. Alex Dee, the Vice President of Fujikura Golf Shafts is one of the top golf shaft techs in the business. A conversation with him is an insight into where golf shaft fitting and golf shaft design is headed. This video was shot in January 2018 at the PGA Merchandise Show. ﻿ Lets start by by looking at the last three Speeder Evolutions. This entry was posted in 2018 Models, Driver Shafts, Fujikura, Russ Ryden - Fit2Score on October 3, 2018 by Russ. Victor Afable has been in the golf business for 35 years, most of it on the shaft side. He knows golf shaft design and manufacturing. Two years ago he started his own shaft company, VA Composites. His shaft are made with Torayca prepreg as are most premium shafts. The designs are based on Victors extensive experience in the shaft business. Now that the Drago has released, let’s look at the measurements. This entry was posted in 2018 Models, Driver Shafts, Russ Ryden - Fit2Score, VA Composites on August 18, 2018 by Russ.